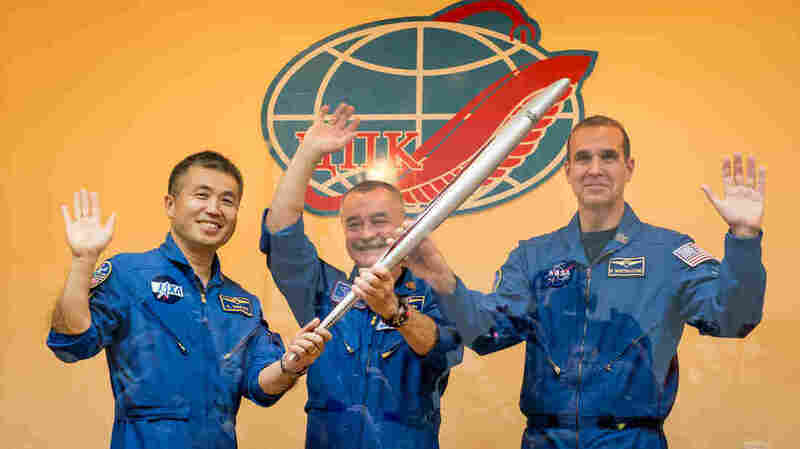 Olympic Torch Relay Headed To Space : The Two-Way The Olympic torch was launched into space on Wednesday night. It will accompany astronauts on a spacewalk before returning to Earth on Nov. 10. The Soyuz rocket that launched from Kazakhstan on Wednesday night has some special cargo on board. In addition to three crew members from Japan, Russia and the U.S., the International Space Station-bound probe is carrying an Olympic torch. 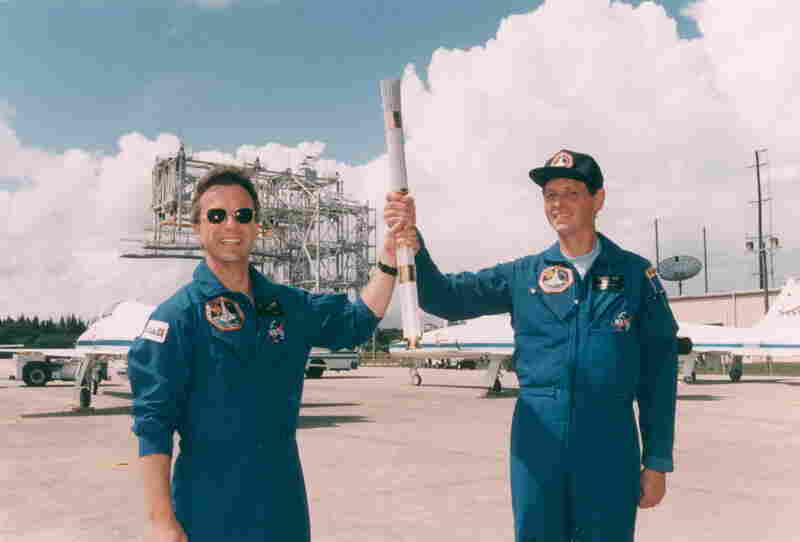 Payload specialists Robert Brenton Thirsk, left, and Jean-Jaques Favier hold the Olympic torch they brought to space aboard Space Shuttle Columbia in 1996. As we reported in June, the torch won't be lit — open flame inside the spacecraft would be dangerous and consume precious oxygen. But Russian cosmonauts Oleg Kotov and Sergey Ryazanskiy will carry the torch outside the station as part of a six-hour spacewalk on Nov. 9. The Olympic torch will return to Earth on Nov. 10, along with three astronauts currently on board the ISS: Karen Nyberg, Luca Parmitano and Fyodor Yurchikhin. This year's torch relay is the longest in Olympic history. The 123-day journey, which crisscrosses Russia, will cover more than 40,000 miles and involve more than 14,000 torchbearers. And this trip isn't the first time an Olympic torch has left the planet — one flew with Space Shuttle Columbia in 1996 before the Atlanta games, and another in 2000 on Space Shuttle Atlantis, before the Sydney Olympics.